A unique, beautiful devotional that offers words and themes from one of the best-loved authors of all time. Charles Dickens was born 200 years ago, yet he crafted stories that translate well to a modern Christians daily life. A Charles Dickens Devotional combines 104 short excerpts from his classic novels with Scripture and new devotional thoughts to create meaningful readings for both longtime Dickens fans and Christian readers who are meeting Oliver Twist for the first time. This title joins A Jane Austen Devotional as part of the new Devotional Classics series and includes excerpts from Dickens' Great Expectations, David Copperfield, A Tale of Two Cities, Oliver Twist, and A Christmas Carol. The good news is you don't have to have a Ph.D. in British literature in order to enjoy A Charles Dickens Devotional by Jean Fischer. And I should know, since I have one. 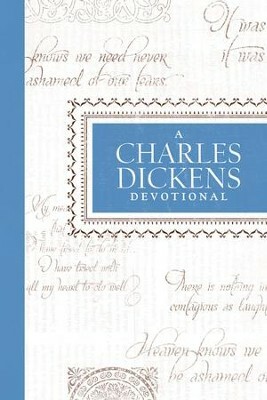 This book, which is the first in a series of classic author devotionals being released by Thomas Nelson (a sister volume focuses on the writings of Jane Austin), first offers a one-page excerpt from one of the long list of notable Dickens novels, such as A Christmas Carol, Great Expectations, Pickwick Papers, David Copperfield, and Bleak House. However, many of the lesser known works of Dickens are also quoted, including passages from Barnaby Rudge, Little Dorrit, and Dombey and Son. Each selected passage will usually quote characters from a Dickens book who are wrestling with an ethical issue, a moral crisis, or a question of human decency. Off-setting this quoted passage is a devotion by Jean Fischer that expands on the comments by the Dickens characters and adds specific biblical references, lessons, and examples. The passage then concludes with a specific passage of Scripture typed at the bottom of that page. The topics focused upon include rest, trust, peace, anxiety, love, adversity, forgiveness, joy, patience, hope, and friendship. At the back of the book are a succinct two-page biography of Charles Dickens and a separate page listing the titles of his most-loved books. A potential drawback to this book is that its language is often very archaic, involving the use of such words and phrases as "mercantile house," "pocket-money day," humbug," "knaves," "phrenological attributes," "merry roysterers," and "saucepan of gruel." Thus, the readers most capable of appreciating its writing and its intended lessons will probably be past age 14. Fortunately, Oliver Twist and A Tale of Two Cities are usually required reading at high schools, so Dickens and his distinct vocabulary won't be totally alien to teenagers, and the companion devotions are very down to earth and understandable. I'm the author/artist and I want to review A Charles Dickens Devotional - eBook.